SAMPARK, an industry-academia summit hosted by the Business Administration, Department of Tezpur university (TU) started on Saturday. The theme of the 18th edition of the event is ‘Bridging the Skill Divide’. A presentation of Business-Idea Challenge, lectures by noted guests, varied sessions on industry talks by business heads are some of the highlights of the event. Ashok Dutta, Chief General Manager, Oil India Ltd (Duliajan) attended the inaugural session as the Chief Guest. 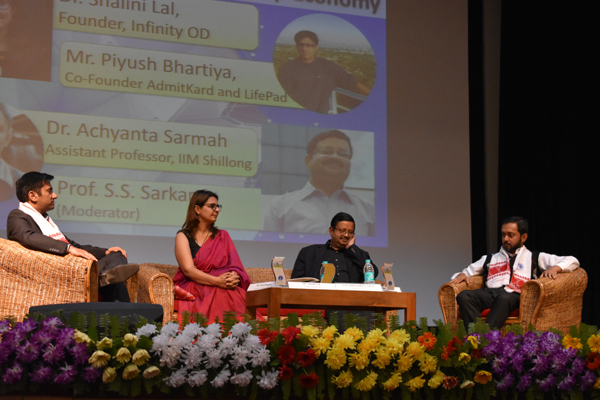 Rajkumar More, Director, FINER, Dr Shalini Lal, Founder, Infinity OD, Satyarth Priyedarshi, Head of Product Marketing, JioChat, Piyush Bhartiya, Co-Founder, Admitkard and LifePad were the other notable guests present on the occasion. Speaking on the occasion, Ashok Dutta said that OIL is a partner in the Indian government’s skill development program and they are focused on skill upgradation to international standards through significant industry-academia involvement. He also mentioned that countries like South Korea has skilled workforce of over 96 percent and all the developed countries has more than 60 percent skilled workforce. But when it comes to India, skilled workforce is only 2.3percent which reflects that there is a gap between industry requirement and the output. He further added the, gap needs to be bridged as India has the opportunity of demographic dividend and thus emphasized the role of more industry-academia collaborations. Addressing the gathering Federation of Industries and Commerce of North-Eastern Region FINER Director, Rajkumar More said that Northeast has immense business opportunities which need to be utilized. He cited the example of his own organization FINER which grew very fast in the region. “Even a country like Germany was ordering from a company (FINER) based in Assam”, he said. More mentioned that FINER and TU has signed a MoU which he hoped will create newer opportunities not only for TU but also benefit FINER. Various panel discussions such as, Skill Based Economy and Startup Economy to Leveraging Technology in meeting the Skill Gap were organized throughout the day. A special session on start-up by FINER was also organized along with a video conferencing session. These sessions were attended by noted entrepreneurs and prominent business heads. Apart from faculty members and administrative staff of the University, students and faculty members from Darrang College, Tezpur also attended various sessions.